Published on December 7, 2007 in Runtime/AutoLISP and Studio/Editor. 2 Comments Tags: 4.1, Theme, UseVisualStyle, Visual Styles. As Owen mentioned in his last post, OpenDCL 4.1 now supports Windows Visual Styles. So what’s that mean? As youâ€™ve probably noticed, each major version of Windows comes with a new set of visual styles or themes (Win2000, XP, Vista). In OpenDCL 4.1 most of the controls have the ability to turn visual styles ON/OFF. By default theyâ€™re ON & therefore inherit the visual style or theme of your current version of Windows. 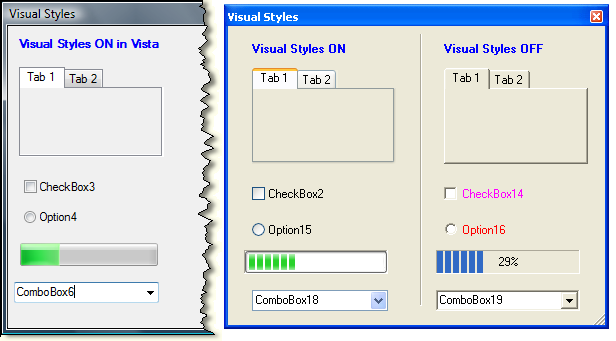 For example if you want to change the foreground color of a CheckBox, you will not be able to as the foreground color is controlled by the Windows visual style. Therefore you will have to set the â€œUseVisualStyleâ€ = False for your new foreground color to take effect. Click this thumbnail for a screen shot comparing various controls with visual style ON/OFF. Published on November 22, 2007 in News. 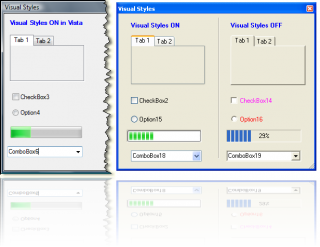 Closed Tags: 4.1, 64-bit, Visual Styles. OpenDCL 4.1 is now released. Some of the major changes since OpenDCL 4.0 include support for the AutoCAD 2008 64-bit platform, improved support for Windows visual styles, many more controls completely rewritten (most notably the grid control, which had a lot of problems in 4.0), addition of functions for modifying ODCL project files via AutoLISP, and of course numerous bug fixes. Next on the agenda is local language support.